Industrial Britain was blighted for much of the 19th century by water pollution caused by factory emissions. This reached its peak in the 1850s, when London, Glasgow and Manchester were all hit by cholera epidemics. This necessitated a widespread change in municipal waterworks throughout the country, and a gradual move towards piped water in the home. This really only became common in the 1890s, though, and water was still largely collected by hand from public wells for sparing use at home. 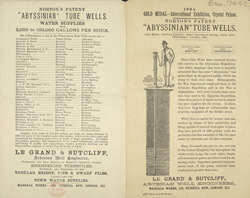 The wells featured in this leaflet derive are known as Abyssinian wells because their general design was based on wells created by the British armed forces on expeditions in Afghanistan, Egypt and Abyssinia (modern Ethiopia) in the 1860s.